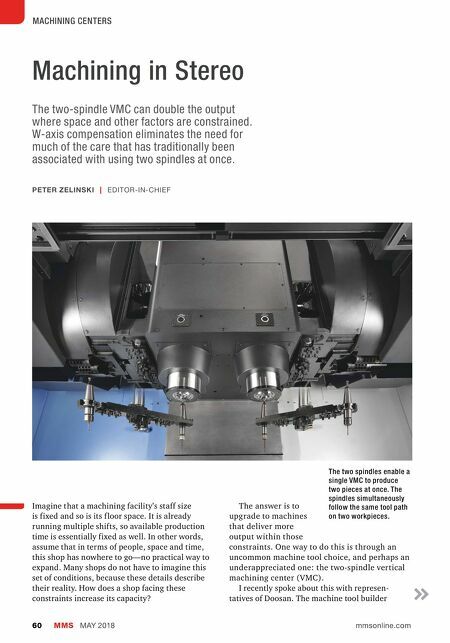 MMS MAY 2018 60 mmsonline.com MACHINING CENTERS Machining in Stereo The two-spindle VMC can double the output where space and other factors are constrained. W-axis compensation eliminates the need for much of the care that has traditionally been associated with using two spindles at once. Imagine that a machining facility's staff size is fixed and so is its f loor space. It is already running multiple shifts, so available production time is essentially fixed as well. In other words, assume that in terms of people, space and time, this shop has nowhere to go—no practical way to expand. Many shops do not have to imagine this set of conditions, because these details describe their reality. How does a shop facing these constraints increase its capacity? PETER ZELINSKI | EDITOR-IN-CHIEF The answer is to upgrade to machines that deliver more output within those constraints. One way to do this is through an uncommon machine tool choice, and perhaps an underappreciated one: the two-spindle vertical machining center (VMC). I recently spoke about this with represen- tatives of Doosan. The machine tool builder The two spindles enable a single VMC to produce two pieces at once. 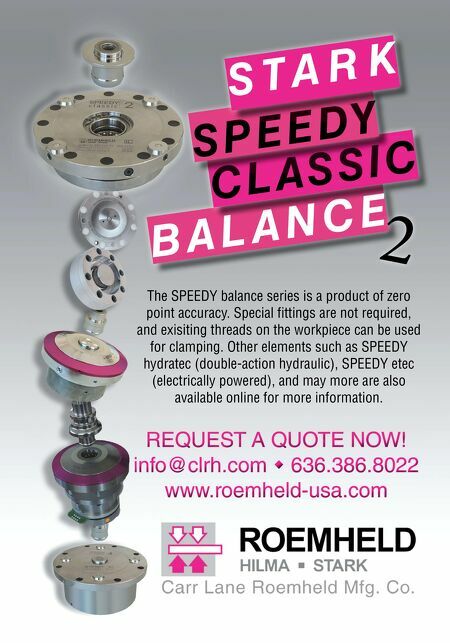 The spindles simultaneously follow the same tool path on two workpieces.